Text Alive! 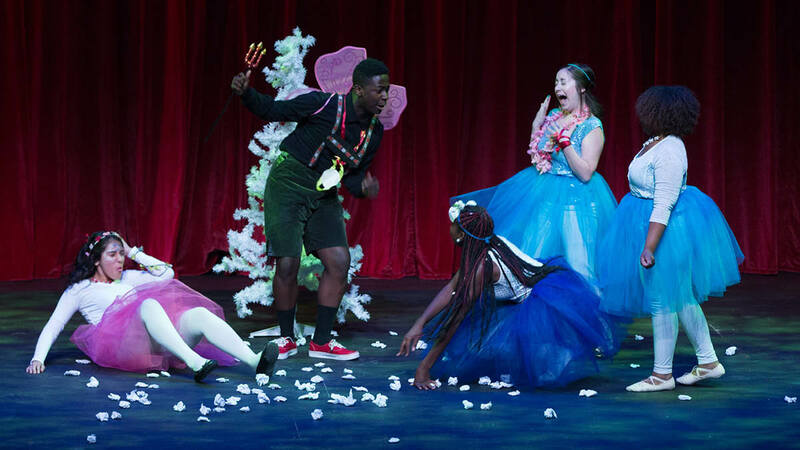 is a free, semester-long arts integration program that brings Shakespeare’s plays to life through a performance-based teaching strategy. Over the course of a semester, students and teachers will develop their knowledge and understanding of Shakespeare through a series of workshops including Introduction to Shakespeare, Shakespeare’s World, Shakespeare’s Text and Page to Stage. In the latter portion of the semester, students apply their knowledge by designing and rehearsing a scene from one of Shakespeare’s plays. Public school English and Theatre teachers for grades 9-12 in D.C., Maryland and Virginia are invited to apply. Times: Tuesdays from 4:30–6:30 p.m.
Time: 9 a.m. to 12:30 p.m. for participants; performance begins at 10 a.m. Application deadline is June 1, 2018! Application deadline is October 1, 2018! We offer this program to enhance your existing curriculum and to help students develop a deeper, more immediate connection to the works of William Shakespeare. We also provide all the necessary materials, including teacher curriculum guides, classroom activities and scripts. 10 in-class workshops: All workshops are led by STC Teaching Artists. 4 Professional Development Workshops for Teachers: Classroom teachers will attend four mandatory workshops at the STC rehearsal studios. These sessions are designed to build confidence and skills for teaching Shakespeare. They focus on the historical context of the specified play and provide a variety of lesson plans and strategies for teaching Shakespeare. Dinner is provided. SHAKESPEARIENCE Student Matinee : All participating students and teachers will attend a matinee performance of STC’s production. Subsidized tickets are provided for this event. Text Alive! Student Performance: Students will perform their scene as part of the whole play before an audience of family, friends and peers on stage at STC.